The Alberta oil sands, or tar sands as some people call them, are top on the list of Greenpeace’s agenda. The same people who climb trees to stop loggers from chopping down Old Growth forests, are looking to stop the oil extraction operations in the Canadian province. The oil is located under Boreal forest, and some say that the amount of greenhouse gases emitted from the extraction process, will make China’s coal factories look like child’s play. The processing will also damage water and the air, not to mention birds and waterfowl (which have been killed in the thousands) say Greenpeace activists. Near Fort McMurray, in the northern part of the province of Alberta, Canada, a piece of equipment designed and supplied by an Israeli company, Ormat Industries, is refining bitumen extracted from oil sands. This equipment, and the process it enables, represents a substantial improvement over existing oil sand extraction and refining techniques. 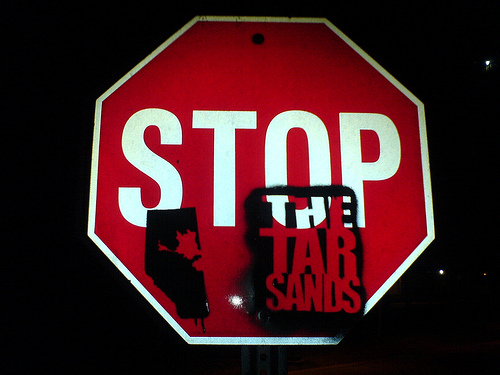 The tar sands industry has a reputation as a filthy, energy-intensive business. The most common method of producing oil from these sands involves strip mining to collect the sand, then heating the collected material with natural gas to draw off the oil. Since oil sands mining began in 1967, about 420 km2 (160 mi2) of land has been disturbed in these operations. Can the bitumen locked within these deposits be extracted without resorting to strip mining? Can the oil be processed without relying on ever more limited supplies of natural gas? The answer to both questions is yes, and Nexen Inc., working with its minority partner, Opti-Canada (which is affiliated with Ormat), is attempting to prove the economic and environmental advantages of this method of oil sand development. The site of this attempt is at a project known as Long Lake. The extraction process used in the Long Lake project is Steam Assist, Gravity Drainage (SAGD). This process relies upon paired series of horizontal wells with one well a few meters above the other. Steam is injected through the upper wells, heating the bitumen deposits and causing them to drop into the lower wells whence they are brought back to the surface for processing. Recent improvements in drilling technology allow a single drill site to send radials out in many directions, allowing large areas of coverage with minimal disturbance of the surface ecology. Once on the surface, this heated bitumen is run through the Ormat upgrader, using a proprietary process called OrCrude. This process produces a synthetic oil with an extremely low sulphur content, making it an ideal candidate for use as a feedstock in diesel fuel (new American EPA requirements mandate a low sulphur content, and blending is a major method of achieving this). In this same process, a fraction of the bitumen is converted into a synthetic natural gas that enables Long Lake to be energy self-sufficient, so that – unlike most other tar sand projects – there is no external need for natural gas. This, in the briefest possible terms, sums up my understanding of the Long Lake oil sands project and the various players and methods used to conduct its business. It is not my purpose here to debate whether tar sands should be used as an energy source. I do note, however, that tar sands currently provide half of all oil produced in Canada, and all projections point to an increase in oil derived from tar sands over the next several decades. Given these realities and projections, I feel that any oil extracted from this source should utilize the best available technology to minimize damage to the environment. Oil sands are a filthy business. Should we allow them to continue unabated, or should we applaud the efforts of companies like Ormat, which appear to be doing something to limit the damage inherent in the development of this resource? I would suggest that, perhaps, the wrath of Green Prophet is in this case unjustified, and that Ormat is indeed operating in a good faith consistent with its environmental pedigree. Michael Wittig is a stay-at-home father in Juneau, Alaska, who spends his spare time on projects to improve the energy efficiency of his own home. He also writes a monthly column for the Juneau Empire titled “At Home with the Kids”. And yes, he does own stock in Opti-Canada, which used to be worth something before the recent financial meltdown. Agriculture is responsible for an estimated 14 percent of the world’s greenhouse gases. The more humans we are on this planet, the more consumption of meat implies proportianlly increased production of methane. Well spoken Michael.The massive changes we require to undertake globally to begin to reduce atmospheric CO2 and methane will take a long time to introduce. However there are technologies available today that will combat emissions created through current industry and power generators. As a realist, I endeavor not to write of dreams and wishes, instead relying upon data, trends, and projections. America IS the number one customer for Canadian oil, for instance, and a case could be made that if America could only learn to use less oil these oil sands wouldn’t be needed in the global energy mix. Fair enough. Oil consumption in America, in fact, is expected to RISE in projections released by the Energy Information Administration. That is a fact as established by the data. Look again at the data. Oil consumption is expected to rise in EVERY NATION ON THE GLOBE. As a realist, I am aware that the only reason this trend is not sustainable is because we are at, or close to, peak oil production, and it will not long be possible to continue expanding the use of this ever more finite resource. We humans are a wasteful lot. This site assails China for its contribution to global pollution, as another example. Also a fair criticism. But again, the data indicates that China’s per capita carbon footprint is only 41% that of Isreal’s. Another fact is that fully one-third of China’s carbon footprint is due to products manufactured for export, thereby decreasing the carbon footprint of nations that import goods from China. Besides having horrendous pollution problems, China is also on the forefront of the green energy revolution, and is spending more than any other nation on the planet to create carbon-free energy. It is also the world’s leading exporter of solar energy products. Another disclosure here: I have long considered China as the greatest of threats to my country, both militarily and economically, and I continue to feel this way every time I look at labels in my local store. Yet I am compelled to set aside my animosity when I see a nation actively working to effect positive change. Yes, it is too bad that they are building so many coal power plants, but the energy provided by coal is powering an ever-expanding green energy sector that may, with good fortune and encouragement, allow for the early retirement of coal. We should all be on the encouragement side. Over the past three years the energy consumed by my home has been reduced by 60% through various insulation and efficiency improvements. I converted from oil to electricity for heat (Juneau is fortunate to have abundant hydroelectric potential). I drive sparingly, sanely, and in a car (a ten year-old Chevy Metro) that gets better mileage than most hybrids. I agree with the premise: Think globally, act locally. We offer lots of solutions. If you follow Green Prophet on a daily or weekly basis, you will see dozens of articles on clean technologies such as solar energy, and about the companies investing in these solutions so we can stop using oil altogether. We also cheer on advances made in the Arab world, and long for an economically viable and stable Middle East. Taking care of the environment will be central. Your criticism is unjustified and reads like a promotion for the Seacrest Group. The very nature of this article above is that we “opened the forum” to let a reader and a shareholder in Opti Canada share his views. If that’s not open-minded and opening the debate for other points of view, then I don’t know what is. Mainstream newspapers form opinions too. Articles “talk” in 3rd person, but there is always an editorial or person behind it, choosing what quotes to use, and deciding what looks good/bad. The tar sands is an issue about morality. The solution: shareholders take their money from companies that pollute, and put your money where your mouth is -– in wind, solar and clean energy. I really enjoy your website, but find it frustrating that your site, along with most others, forms its own opinion but does not invite or offer an individuals opinion into other possible solutions to climate change. What if there is a simple solution that allows the multinational power producers to continue to use fossil fuels, while eliminating all harmful emissions from power stations and ultimately provide a reduction of 35% in global CO2 and methane emissions? All government goals in the reduction of carbon emissions would be met or exceeded, without the extended pain of attempting to target the masses. This would surely invite the multinationals to partner governments, scientists, etc, in a positive solution to climate change. Funds would therefore not be an issue and rather than the constant bickering and the lack of responsibility and leadership displayed by global community leaders the issue could be dealt with quietly by industry and governments, without the disruption to the lives of most people in the world. A vote winner if I’ve ever seen one! There is such a solution available. The vision and concept is not far fetched and has been assessed by scientists and engineers to successfully allow for the total removal of harmful emissions from coal fired power stations at the time of the combustion of coal. The inventor has little support and experiences the usual “smoke screens & mirrors” provided by governments and multinationals. Where is the leadership in that? With universal acceptance, the “UHT” technology designed by The Seacrest Group will go a long way towards the total elimination of carbon emissions from coal fired power stations around our planet. The technology also offers many other benefits towards the fight against climate change and the provision of water, power, housing and the elimination of waste within a community. Surely someone, somewhere, must see the sense of providing the change required in carbon emissions, without the disruption to the general population. The Seacrest Group will provide this option.